Google AdSense Ads Graying Out Colors By Itself? 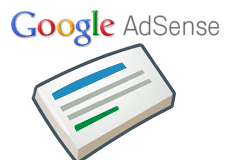 Google AdSense publishers started complaining yesterday that many of their colorful ad units on their web sites went from bright colors to a muted and toned down gray look. I just noticed that my ads have lost all the changes I made to them and are now grey both links and text. Inside my adsense account they are configured to be green. I don't see the gray ad units this morning but it seems like it was an issue throughout most of yesterday and now things have reverted back to normal. Did you notice this?